Accrington Stanley boss John Coleman has criticised a section of fans after they questioned his team selection for their drawn FA Cup match with Yeovil. Coleman's side were losing 1-0 at half-time in the second round tie but Tom Aldred's strike secured a replay. 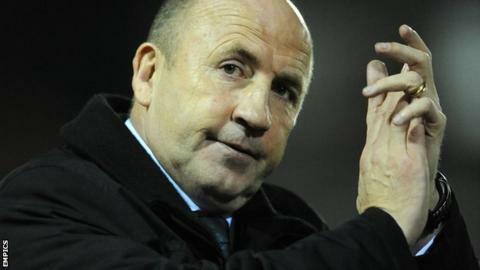 The 52-year-old returned for his second spell as Stanley boss in September. "A couple of people were shouting at half-time and I don't know what makes them better qualified to pick a side than me," said Coleman. He told BBC Radio Lancashire: "There must be a lot of Pro License holders in the main stand that I don't know have got their badges. "Maybe they want to come down and take a couple of sessions? "Anyone who can complain about how we played today should be going to watch a different sport." Coleman managed Stanley for 13 years during his first stint, leading them from the Northern Premier League First Division into the Football League. When he left the Crown Ground for Rochdale in 2012, he was the third longest-serving manager in the country behind Sir Alex Ferguson and Arsene Wenger. What is a Uefa Pro Licence? Read more on What is a Uefa Pro Licence?